Bloomsbury Central Baptist Church is a thriving West End church in London, at the top end of Shaftesbury Avenue. The church is firmly planted in the local community, with an open doors policy, and offers Sunday lunch to people living on the street or in hostel accommodation. Bloomsbury also has a strong emphasis on music, with regular lunchtime concerts, and on social action. I worked with their web group to produce the current website, which was launched in 2007. 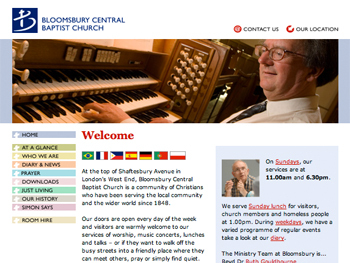 The site, which is maintained by the church, provides information about Bloomsbury’s many activities, plus weekly MP3s of their services, with links out to blogs and social media. We’re currently in planning for a complete redesign of the site, which will be built in Expression Engine, the online content management system.